You need to contact the department about guest parking. If you fail to contact us prior to parking in the department space, you stand the risk of being ticketed or towed. 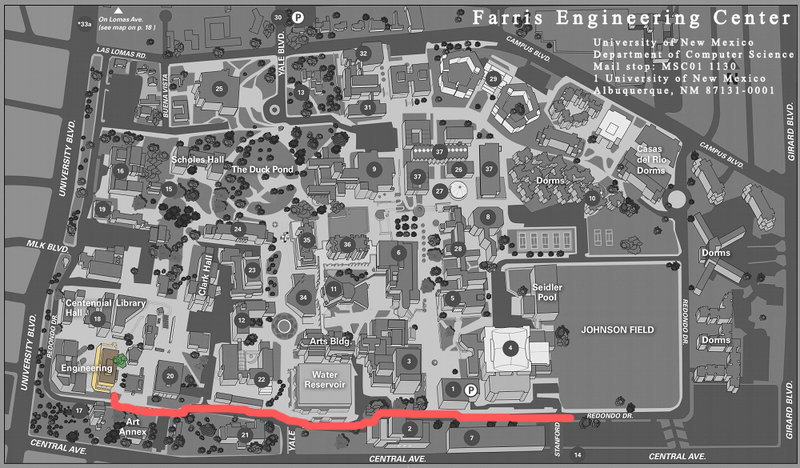 The Department has one reserved parking space just East of Farris Engineering Center (space #B-46). B-46 is located in a small parking lot near Farris, not in the larger B lot. See the map below for details. To reach this space, enter the campus from the Yale Blvd/Central Ave. entrance and turn left to travel west on Redondo Road. If you turn enter the campus at Stanford and Central, and travel east on Redondo, there is a Visitor’s Parking Structure to the left. Fees will apply: average amounts are often $2 – $3 dollars. There are also some public lots and metered parking in the areas immediately surrounding the campus.